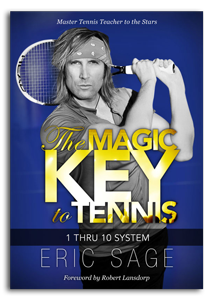 Eric was the #1 tennis player in Canada as a junior - trained and played with Pete Sampras, Jim Courier, Michael Chang, and Stefan Edberg at the world-famous Bollettieri Tennis Academy in Florida and with Robert Lansdorp in Los Angeles. He received a tennis scholarship to San Diego State University and then traveled world-wide playing on the professional tour for four years where he earned an ATP world tennis ranking. He founded the Los Angeles Tennis Academy and was the tennis director at the world renowned Hotel Del Coronado in San Diego. After 19 years of tennis competition, Eric achieved an extraordinary career transformation by becoming a professional musician. He studied voice with Seth Riggs (Michael Jackson, Ray Charles, Josh Groban) and piano with Jazz great, Terry Trotter (Frank Sinatra, Natalie Cole, Celine Dion). Eric has gone on to have an amazing music career working with many multi-platinum acts such as: Slash of Gun’s N Roses, Vince Neil of Motley Crue, The Bay City Rollers, and The Beach Boys. Eric performs and sells his solo CDs in several countries around the world, is a successful motivational public speaker, and is actively involved in the Make-A-Wish foundation.